I recently read an article that said a school in Asheville, North Carolina had the worst chickenpox outbreak in the state in 2 decades. The article was interesting, and it also let me know I had a hole in my knowledge ... "What?!? - There's a chickenpox vaccine?!?" I was happy to see the data, but on the other hand a little sad that it was in pdf format. I didn't have a fancy pdf reader handy, therefore I used the brute-force alternative - I copy-n-pasted each of the 31 pages of the table into a text file. There are several ways to parse text in SAS - this is just the first way that came to mind (there might be better ways, of course!) When all was said & done, I had two datasets. One containing a line of data for each of the nearly 2,000 schools, and one containing an overall summary for each of the 100 counties. 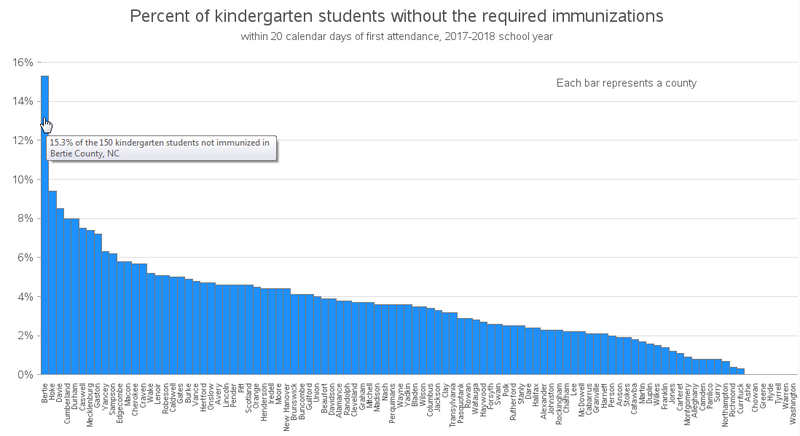 For my first graph, I created a bar chart showing the % of kindergarteners not immunized in each of the 100 counties. It was an OK plot, and let me quickly know the range of values. But the bars sorted in the default/alphabetic order didn't really tell me as much as they could. With data like this, it's natural that you would want to compare the values. Therefore I created a new version of the chart, sorted by descending order, which lets you more easily compare the counties and see the spread of the data. Notice in the screen-capture below that I also added mouse-over text, so you can see more detailed information. I used semi-transparent markers in the plot above, so you can see where multiple markers are plotting on top of each other ... but that technique isn't quite adequate with this data. Most of the schools have between 0-10% ... but that's not totally obvious from looking at the plot. Therefore I created a 2nd version with box plots overlaid. But there was one odd outlier (circled in red, above). What school has 930 kindergarten students?!? I first assumed this was a school in a big city, like Raleigh or Charlotte. But the mouse-over text told me it was China Grove Elementary School, in Rowan County. It just so happens I grew up in Rowan County, and I've driven through China Grove, and it's a pretty small town. Therefore I was suspicious of this claim that their elementary school had 930 kindergarten students. 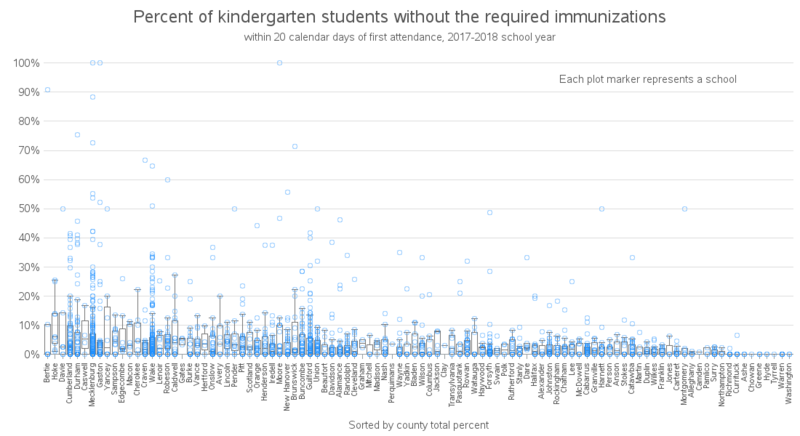 I did a quick Google search, and it appears that school only has about 600 students total (PK & K-5) ... therefore it is very likely the 930 kindergarteners listed in the original data table is incorrect. I was tempted to change the data value from 930 to 93 (which is a much more likely value) ... but I really can't do that with a high degree of certainty, therefore I decided to just delete China Grove's line from the data (until the value can be researched & verified). 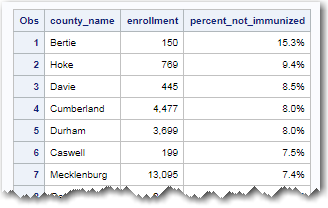 I also suspect that the Rowan County % not immunized value is probably impacted by this bad data value ... but I have no way of definitively checking with the data in the table, since the % values are pre-summarized, and they don't include all the raw data they used to calculate it. Back to the original article, it was the Asheville Waldorf School that had the chicken pox outbreak. That specific school isn't actually listed in the 2017/2018 data that the article pointed to (perhaps it is a new school just opened in 2018/2019?) 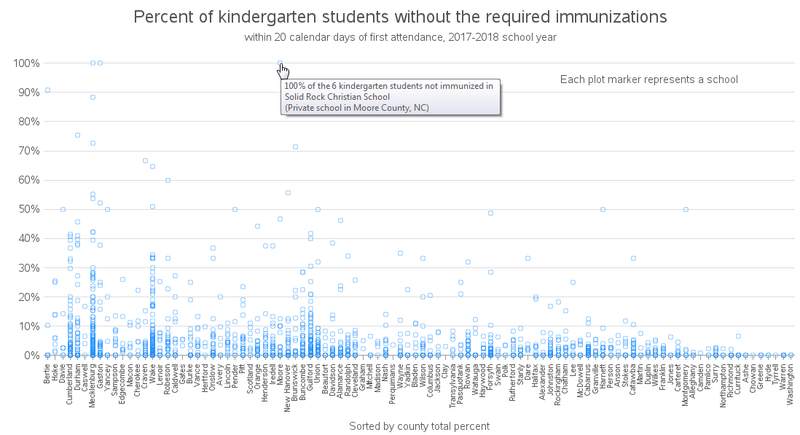 ... but Asheville is in Buncombe County, therefore it might be interesting to look at the Buncombe county data and see if they have a non-immunization rate that's higher than the rest of the state. I used the mouse-over text to find Buncombe County in the map above, and it is colored light gray, indicating it is one of the counties with the best immunization rates (only 4.1% not immunized). 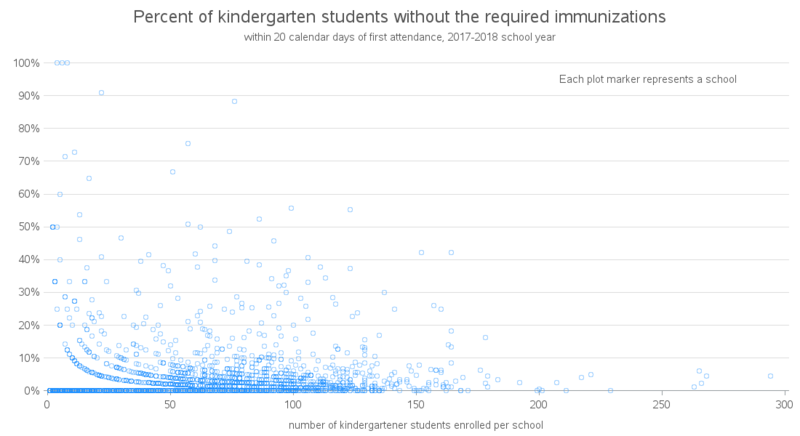 Hopefully you've learned some interesting information about immunization rates, and perhaps even a little about wrangling data values out of a pdf file. Note that you can click any of the graphs above to see the full-size interactive version with mouse-over text, and here's a link to the full SAS code used to create them. To get your total % not vaccinated. I have looked for more info on the data but I have not found much. Means that the child can not enter the school because they are not vaccinated and have not revived an exemption. Q. 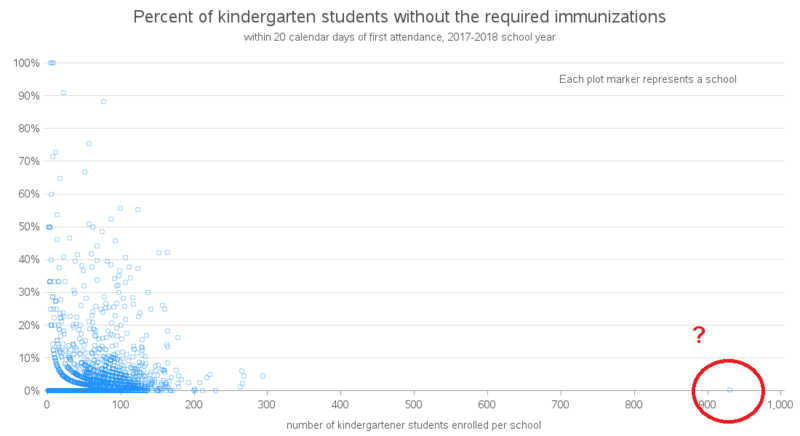 What if a student has not met the immunization requirements 30 days after school started? A: Parents have until the close of business on the 30th calendar day after school has started to submit immunization records to remain in compliance. 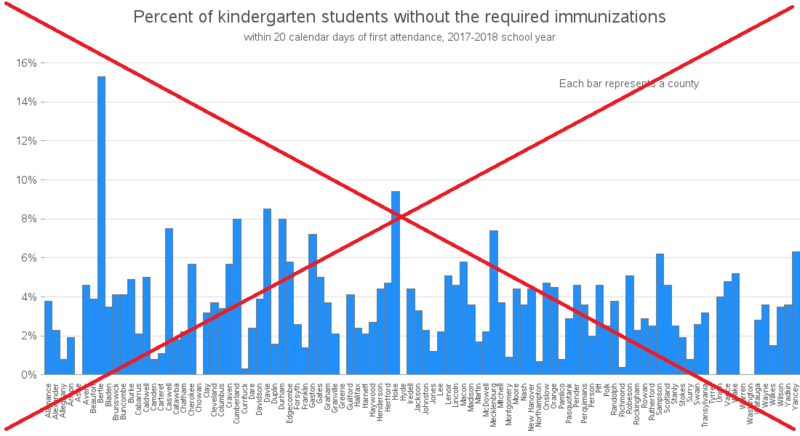 On the 31st calendar day, students who do not meet the minimum immunization requirements, do not have an immunization record on file, or are not in-process to receive required immunizations must be excluded from school per public health law. The student may not return to school without those documents. If you know any more feel free to email me! It's not quite clear from the data page whether the 'total' column includes, or doesn't include the ME (medical exemption) and RE (religious exemption). Thank you Robert for another great post.